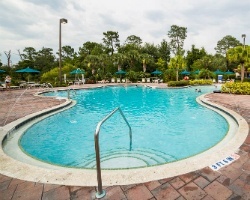 Green fairways, deep blue lakes, and neatly tailored villas make *Holiday Inn Club Vacations at Orange Lake's East Village* the perfect place for your Orlando vacation! Located on the shores of the 80-acre Orange Lake, this beautiful resort offers boating, fishing, board sailing, waterskiing, and sunbathing. Guests can enjoy the four unique golf courses, multiple pools including a 12-acre pool complex complete with a lazy river, mini golf, activity centers, arcades, fitness center and much more! 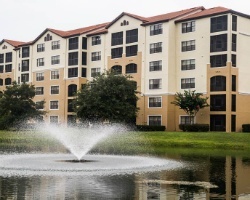 For guests that want to explore the area attractions, Walt Disney World, SeaWorld, and Universal Orlando are all just minutes away. Discover more about this beautiful retreat by visiting the link at www.orangelake.com. *RCI Gold Crown Resort* Featuring a finely appointed 2 bedroom, 2 bath suite that will accommodate 8 guests comfortably. Usage is biennial odd in week 42. Offered by Timeshare Broker Services. For more information or to make an offer, please submit the inquiry form.